First, a tea bag? Really? It’s a tea focused on “beauty from within” and talks about beauty this and that. 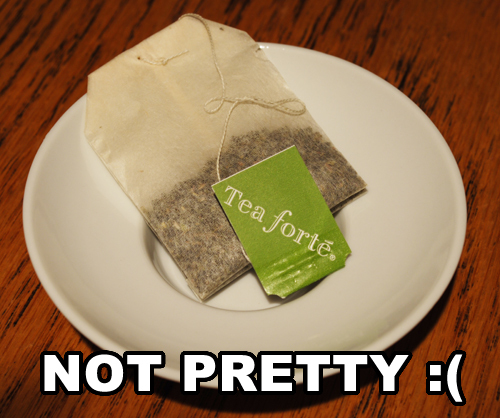 Your tea bag is not beautiful. The little pouch holding the tea bag is nice. Well designed. Has that white, clean and beauty product theme to it. But you tear off the top and get a standard tea bag? Not even a pyramid bag? DEMERIT! Terrible. Really. I did your last sampler with the loose tea packs. Those were pretty. The loose tea was pretty. I’ve got a couple of your pyramid bags I stole from a friend, with the pyramid cardboard packaging. Pretty. Tea bag… not pretty. Dry: Sweeeeeeeeeeet smelling. I think I smell blueberries and minty. But it’s sweeeeeeeeeeeeeeeet. Wow. Aroma: Now I get some cucumber. Less sweet. Slightly mint. Maybe some blueberries. Smells a little like those cucumber aloe creams. Pretty refreshing. Flavor: Hmm. A light, clean tasting tea but nothing to get excited about. A little cucumber. A little mint. If I think real hard I might get blueberries. A little green tea. A whole lot of MEH. It gets better as it cools down. It’s almost refreshing. I just want more though. I can’t imagine that this is the epitome of cucumber mint teas. Maybe if I had steeped the hell out of it there would be more oomph. Where are the “sweet, succulent blueberries”? Tea Score: 55 – Not impressed. I want it to taste at least as good as it smells. It doesn’t. Cupboard Score: 50 – I would never buy it. If it was a gift, I’d drink it.